This is a topic I’ve touched on briefly in other posts, but as it affects me so much these days, I feel the need to share more of my experiences and emotions. 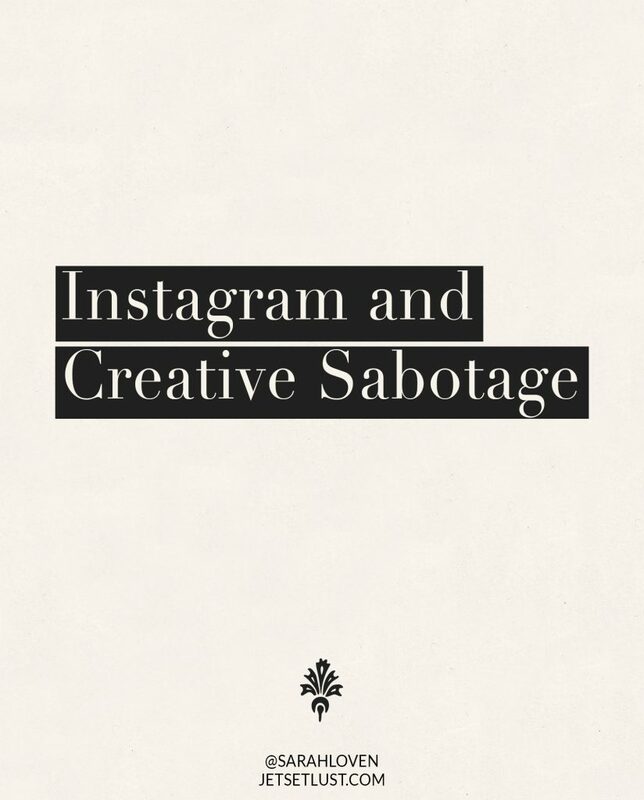 Instagram and Creative Sabotage… what am I talking about, you ask? I’ve always grown up being part of some creative niche, forum, or platform. Call it what you will. From dancing ballet since age 3, to photography, art and writing sites. I have learned everything I know from being involved in these communities and letting them influence me. But what I also learned from these artistic/creative communities was the etiquette of artists, and the respect for another’s accomplishment or great work. Which brings me to the issue you know I am greatly affected by (if you’ve read my other articles)! 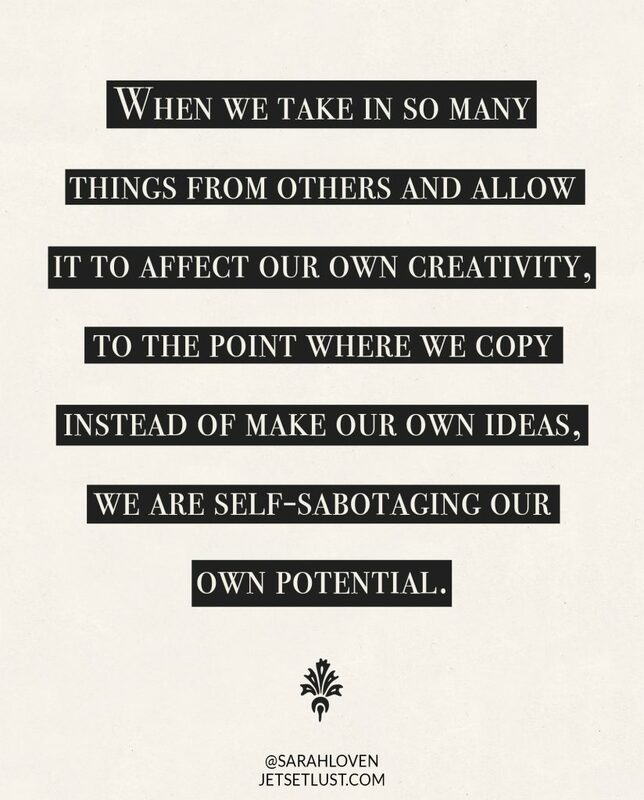 When we take in so many things from others and allow it to affect our own creativity, to the point where we copy instead of make our own ideas, we are self-sabotaging our own potential. We ruin our chances to create work that is truly good, and fulfill our own personal visions. I heard a popular YouTuber say how they don’t follow anyone and just use their channel to post their own content, in order to not have their ideas be swayed by what others are doing. WOW! I’m almost jealous that they are able to keep their self on the straight and narrow as a creator, and protect their vision! Almost every day I wake up, check my phone, and see someone’s content or caption completely copying someone else I know, or myself. If you’ve read my other articles, you know how I feel about this. And can I just say, nothing starts my day off wrong than seeing someone rip me off the very day after I post something I’m proud of. When I create something that is essentially a little piece of me, something that makes me feel good and accomplished, and then in less than 24 hrs (or sometimes within days) someone has to say what I’ve said, or shoot where I’ve shot, or copy a photo down to the outfit/lighting/pose/editing/etc… It makes me wonder why I even bother. If I invest myself into my work… key word being MY work, then why bother if it’s just going to be giving someone else a shortcut? If it’s just going to become “someone else’s work”? My creativity is not for others, it is my own. I’m not a creative bank for someone to show up and withdraw ideas from. So when I try my hardest, why does everyone else feel free to take the easy route, skip working on their own ideas, and steal another’s? I’ve asked myself if I read into this too much. Maybe I’ve been gaslighted on these types of scenarios before and can’t say for sure. But I put the question out there to you guys- is it too much when people copy images, locations, outfits, edits, captions, topics, and more? Even down to suddenly changing what they’re doing to use my methods and work flow for HOW I do what I do? It may seem strange, but it feels like an invasion of my personal life when I share about how I go about my shoots, edits, painting, and writing, and someone decides that they can/will, verbatim, do what I do. What I’ve learned over years of experience, (actually over a decade) has made me who I am and taught me what works best for me as a creator. It has allowed me to develop my traits as an artist, and give me my unique vision. So, maybe you can understand how I am a little bewildered when someone attempts to take on my workflow or creative vision in the blink of an eye. Another example lies with my voice… As I’ve started using it more after years of letting it fade to the background, it too has become a freebie for other’s to use. I’ve written about very personal feelings on topics that you guys really appreciated. Topics that were legitimately conversations between my husband and I. And because I poured my heart out, you guys resonated with it and appreciated my words. It reached a wider audience because of that. On multiple occasions! So what do other influencers decide to do? Instead of just letting me have my voice and appreciate it, they have to re-write my own words for their own blog, garnering acclaim for their “brilliance” and unique perspective on the topic. This…. this kills me more than my photos being copied. Because this is my voice, these are my thoughts, it’s all me and feelings from my personal life. And people think they can literally steal it and accept the praise for what isn’t their own. They can sit happily, being told that their words are changing people’s lives, and accept promotion for speaking out. Am I the only one who can feel so wronged by something like this? I’ve had thoughts about blocking those who so readily use my content as fuel for their own. And I’ve had thoughts of unfollowing nearly everyone who makes me feel jealous, frustrated, or whoever affects my creativity. Just having my platform to share my work and not let my vision be swayed seems appealing. But I’ve always enjoyed appreciating other creative’s work, I’ve done this all my life. I don’t want to go to such dramatic lengths, but maybe in the end, it’s what I need to do for myself, as an artist. Even if just for a time. If everyone’s work is a free-for-all template to be stolen, used, and ripped off… then creatives will cease to be unique or sought after for their own vision and skill. All of us creators will suffer for work, work that becomes of less value to the world, because it’s not hard to find the same thing from someone else. And that idea truly scares me! I circle back to my question: what is the point of putting my unique work out there if it just serves as a free template for someone else? Or a stepping stone to success? Where is the artist/creator etiquette?